Since the year of its founding in 2002, Slide has been a leading company of outdoor and indoor decoration, lighting design for contract, events and residential areas. Its success is due to its founder, Giò Colonna Romano: his fancy fantasy matches perfectly with his thirty-year know-how in the processing of plastic resins. As a demiurge, Slide creates colourful design objects: starting from a humble material as polyethylene, Slide elevates it to refine high quality design and elegant art objects. The present and the future of Slide is the constantly research for innovation. Slide is always looking for new materials, as the introduction of soft and rigid polyurethane, and it is looking for new shapes, thanks to the collaboration with some of the most famous designers of the world, as Alessandro Mendini, Paola Navone, Stefano Giovannoni, Marcel Wanders, Karim Rashid and Marc Sadler. The first success was the production of luminous bar furniture, which can be the protagonists of unforgettable events and contract that do not want to be unnoticed. Slide constantly grows up in different products and sectors: we acquire and develop the Design of Love collection, we create rental service of furniture, and we look for beauty, with the Slide Art branch. Between artisanship and innovation, Slide finds its first home in Buccinasco, where offices and factory are settled, but today Slide conquers also the heart of Milan, thanks to its new opening show room in Foro Buonaparte. Today Slide is known worldwide and its design products are exported in more than 130 different countries. Slide’s main goal is to bring quality, creativity and design culture to Made in Italy all over the world. Slide takes the concept of Made in Italy a step further, thanks to the idea of “Made in Slide”: we make the whole process of production on our own. Engineering, moulding, finishing, assembly and lacquering are strictly executed in our factories in Buccinasco, near Milan. Thanks to this philosophy, we gain a double advantage: on one side, we have the full knowledge of the ideational and productive process, and, on the other side, we have the absolute control over the quality of the results. 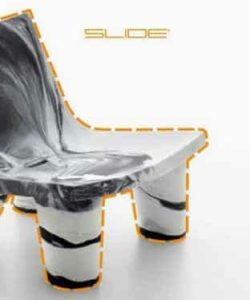 Another important element of the Made in Slide philosophy is the supervision of the materials we use: low-density linear polyethylene is 100% recyclable and processed according to a zero-emission process, with a view to environmental sustainability that sees us close to Non-profit associations that fight for the protection of our planet. NEED MORE SLIDE INFORMATION ?